SPECIAL AUDIO PROMOS INCLUDED BELOW! LOOK FOR "AUDIO CLIP" LINKS. 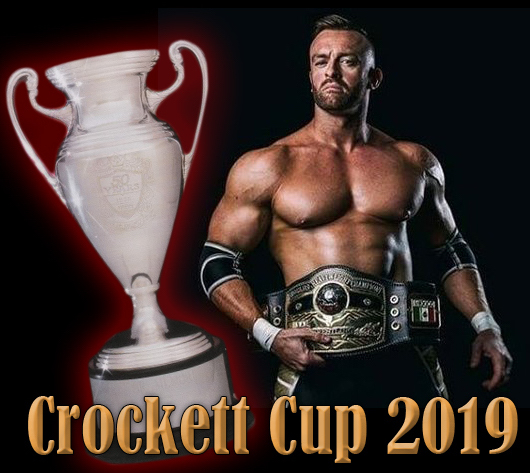 If you missed earlier posts in this series, check them out in the links below, especially the INTRODUCTION, which puts the whole tournament in a perspective that serves as a launching point for the following discussions. 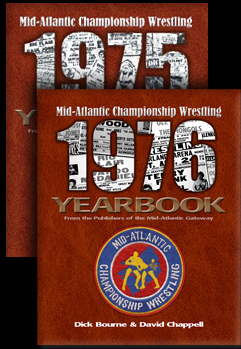 Having concluded the first two city tournaments in Greensboro and Charlotte, North Carolina, the tournament moved to the Commonwealth of Virginia and the fabled Richmond Coliseum in the capitol city of Richmond, Virginia. The Richmond leg of the tournament featured three returning teams and four new teams. *In TV promos, Leroy Brown was said to be Ray Steven's partner while the newspaper ad (at right) named Mike George. Research is unclear if it was Brown or George who actually teamed with Stevens on the card. Jack and Jerry Brisco - While Jack Brisco was now a full-time wrestler in the Mid-Atlantic area, he and brother Jerry Brisco had come in for the original two tournaments in Greensboro and Charlotte from Championship Wrestling from Florida. Jack wound up staying in the territory full time. Jerry would eventually join him as a full-time tag team partner in December of 1982. 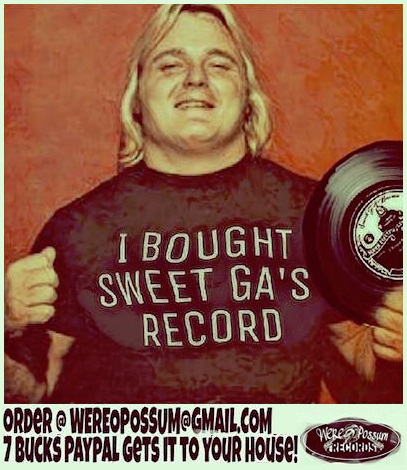 Tommy Rich and Bob Armstrong - These two were the top babyfaces for Georgia Championship Wrestling out of Atlanta, and were brought in by booker Ole Anderson for the Richmond tournament. As mentioned in earlier posts, Anderson was booking both territories at that time. 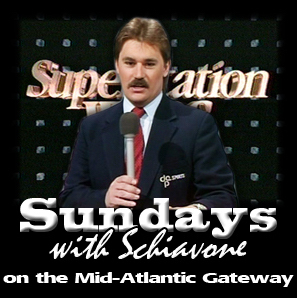 Rich had appeared on the previous tournament show in Charlotte where he challenged NWA World champion Ric Flair in the singles main event. Armstrong had appeared on a number of Mid-Atlantic shows recently against Roddy Piper as part of their big feud in Georgia. 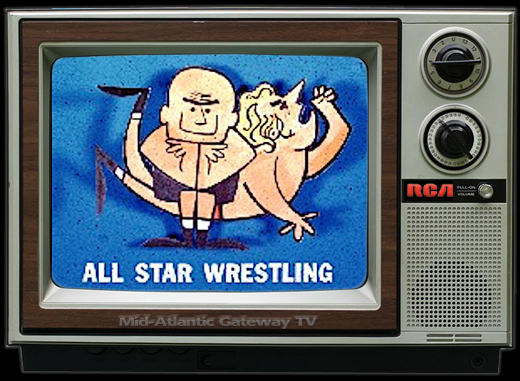 Austin Idol teamed with Big John Studd as his new partner in the tournaments after Idol and Ivan Koloff failed to advance in the previous tournaments in Greensboro and Charlotte. 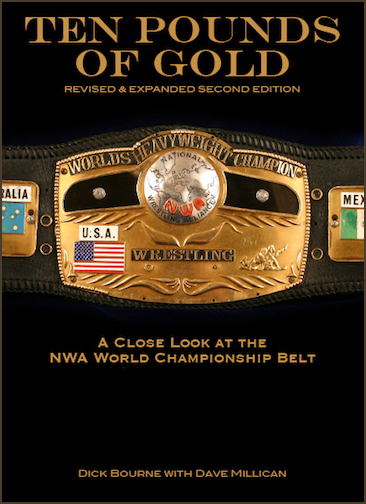 While Studd was making appearances semi-regularly in the Mid-Atlantic area, he was the top heel in the Knoxville territory at the time, feuding with both Blackjack Mulligan and Blackjack Mulligan, Jr.
Kelly Kiniski (son of former NWA World champion Gene Kiniski) teamed with Ron Ritchie, the "young lions" entry in the tournament. 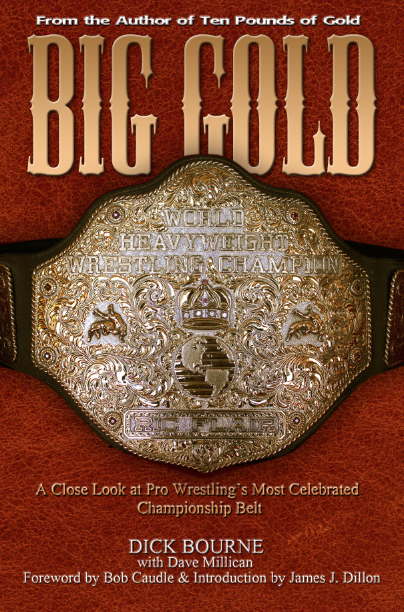 Austin Idol and John Studd were considered a Mid-Atlantic team for the tournament, although Studd was spending most of his time in the Knoxville territory at that moment, and Idol spent at least half his time in Georgia. The Richmond tournament only featured seven teams. 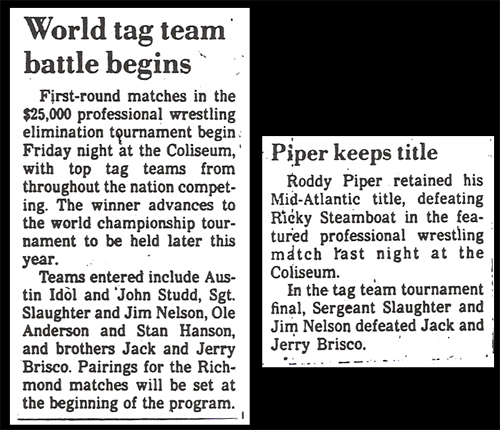 The tournament came down to the Brisco Brothers and the team of Sgt. Slaughter and his young recruit Pvt. Jim Nelson in the championship round. In a big upset, the Marines got past the Briscos to take the honors in Richmond. 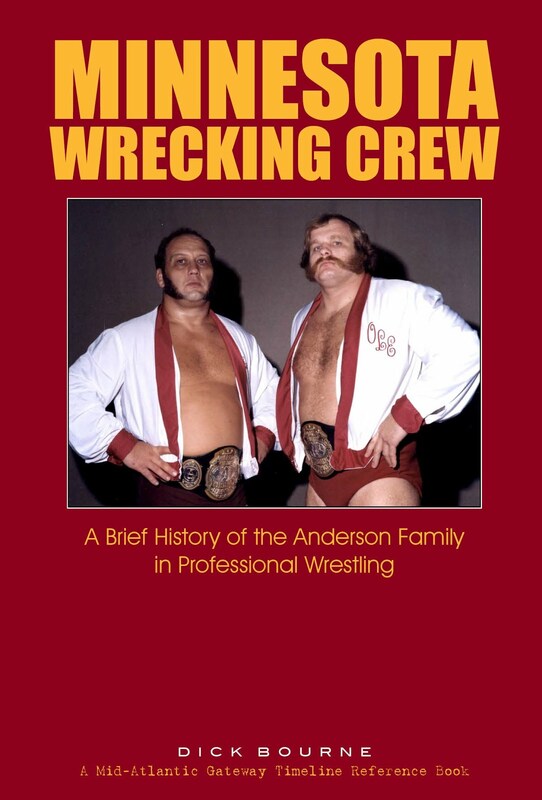 The Briscos defeated Ole Anderson and Stan Hansen in the semi-finals to advance to the tournament championship. It was their second win over Anderson and Hansen in these tournaments having defeated them in the finals of the Charlotte tournament on 2/14. 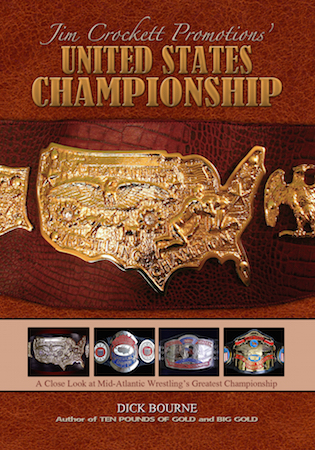 Slaughter and Nelson advanced to the championship by defeating the Georgia team of Tommy Rich and Bob Armstrong in the semi-finals. 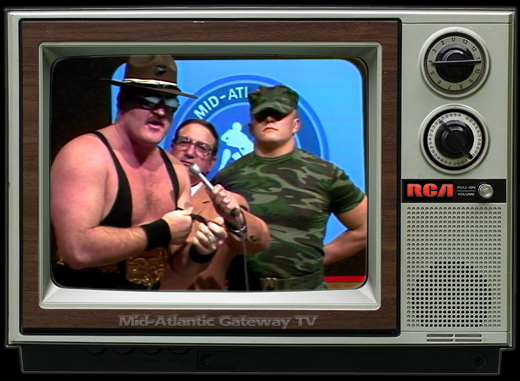 It is believed they received a bye in the first round due to Slaughter's additional match that night with Blackjack Mulligan Jr. (Barry Windham) in Sarge's "$1000 Cobra Challenge." 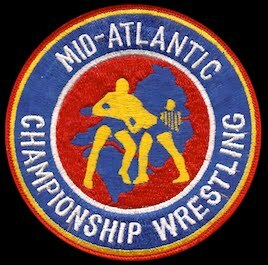 Roddy Piper and Ricky Steamboat were involved in a big feud over the Mid-Atlantic title and this match was toward the end of their run together. 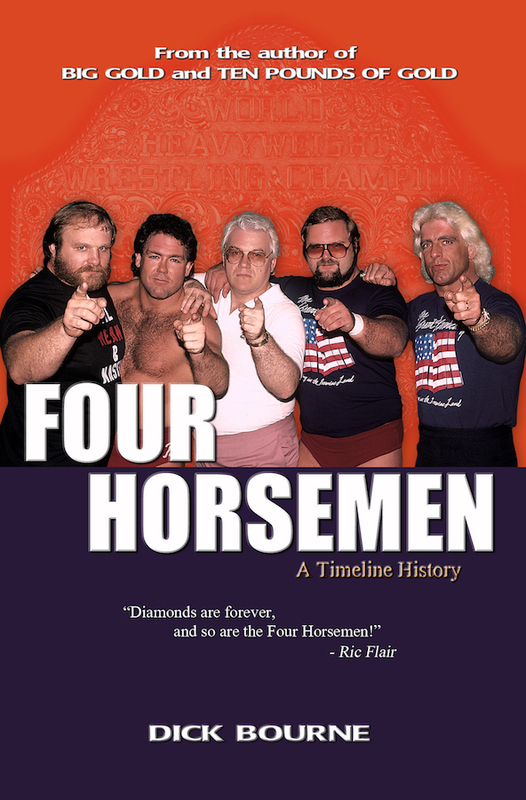 In this match, the ring would be surrounded by wrestlers in what was known then as a "lumberjack match." It was designed to keep wrestlers from running. If a wrestler left the ring, the lumberjacks would toss him back in again. In previous encounters, Piper had left the ring and been counted out in order to save his title. SGT. 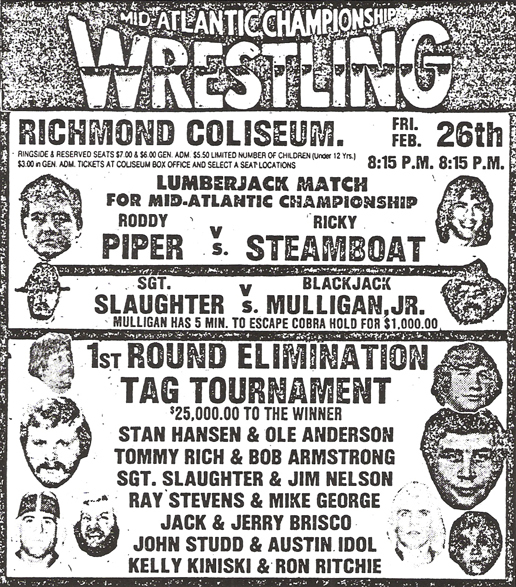 SLAUGHTER vs. BLACKJACK MULLIGAN JR.
Special thanks as always to Mark Eastridge for the newspaper clippings. 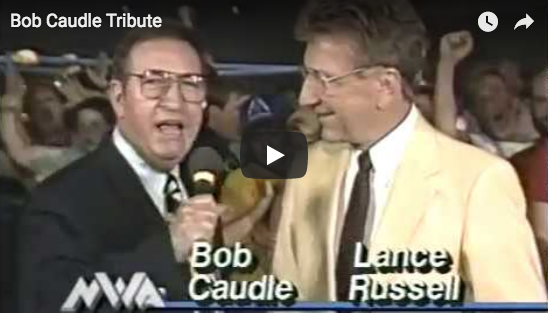 Eddie Maccon, in attendance that night in Richmond, provided some of the bracketing information. The vintage audio recordings are from the collection of David Chappell.